Cleans and Sanitizes in 30 seconds! In addition to being bactericidal against Staphylococcus aureus (Staph), Salmonella enterica, Pseudomonas aeruginosa & Escherichia coli (E-coli), it is also virucidal against Rhinovirus (the common cold virus) and Influenza A including the Pandemic 2009 H1N1 on hard, non-porous, inanimate surfaces… and much more coming soon! From pipes bursting to dishwashers leaking, many water loss jobs happen in the kitchen. Being a Food Surface Contact Sanitizer means restorers can decontaminate sensitive kitchen surfaces without rinsing, wiping or leaving behind synthetic chemical residue. Uses the same proprietary Botanical Active Ingredient Benefect is known for – Thymol present as a component of Thyme Oil. We formulate with whole essential plant oils, not synthesized copies of the chemicals found within the oils - we think the authentic way is the right way! Restoration professionals face many real-world situations where, according to the EPA, typical hard surface disinfectants may not be appropriate. From semi-porous walls and wood framing to concrete and carpets, new Decon 30 effectively eliminates odors produced by odor-causing fungi, bacteria & other odor-causing organisms on porous and non-porous surfaces. 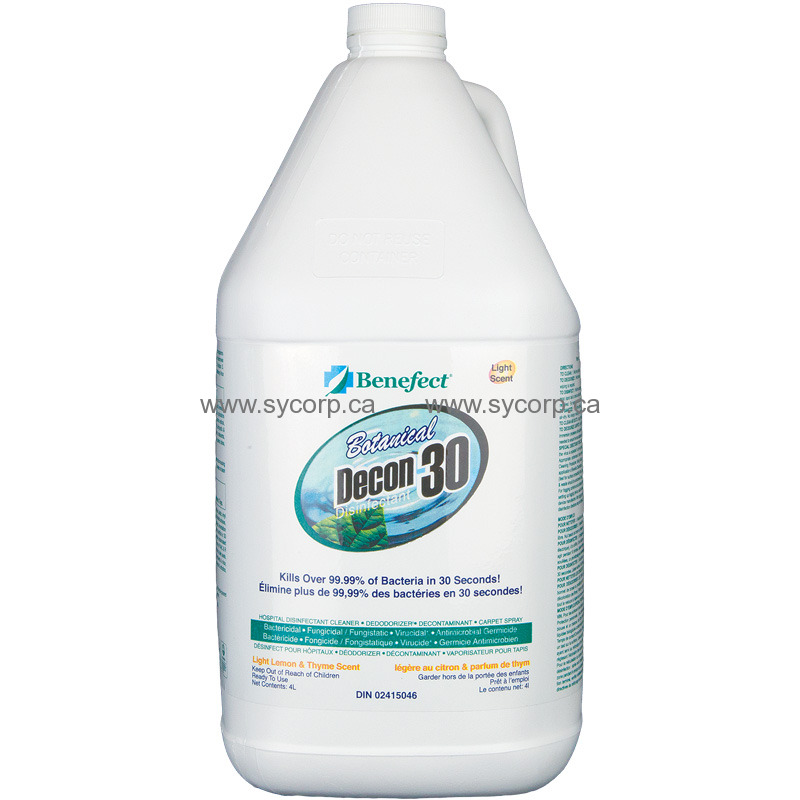 Decon 30 combines powerful botanical cleaning surfactants with the proven killing ability of Benefect's Active Ingredient to clean and disinfect in one easy step! This makes Decon 30 ideally suited for general decontamination of remediation sites, equipment and contents. Ideal for decontamination, preventing cross-contamination, cleaning, disinfecting and deodorizing in water damage applications.